A summertime staple, watermelon matures in 70 to 85 days and comes in pink, yellow and orange hues and in seedless varieties. Gardeners in cold areas will want to plant watermelon plants rather than grow melon from seed. These plants need full sun to develop. 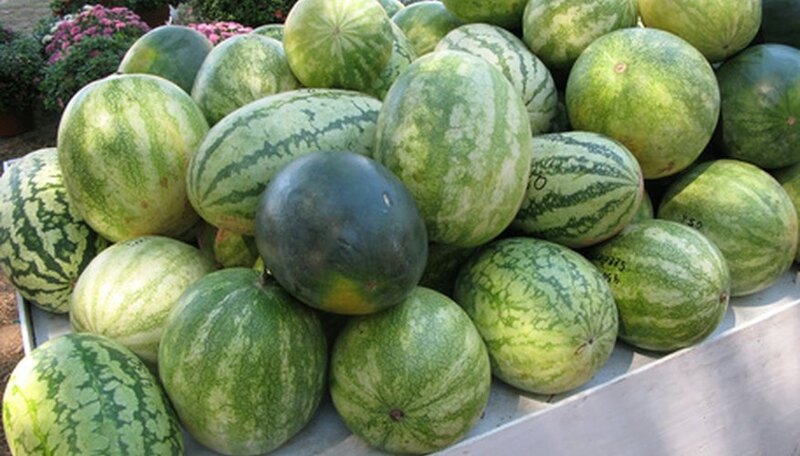 Watermelons provide a high dose of vitamins A and C as well as beta carotene and lycopene. Growing watermelon plants successfully requires preparation of the soil and proper spacing. Wait until all danger of frost has passed for your area and the soil warms. Then prepare the ground for planting by turning over the soil with a shovel to aerate it. Remove any rocks, weeds, roots or debris so the watermelon can grow without competition. Dig a hole for your watermelon plant that is twice the size of the plant's root ball. Remove your watermelon plant from its container. Break apart the root ball by squeezing it with your fingers. Untangle any tangled roots. Place the watermelon plant in the hole so the roots rest in the soil and the plant sits at the same depth as it was planted in the container. Fill in the hole with soil, pressing gently around the base of the watermelon plant. Plant other watermelon starts in this manner. The University of Illinois recommends leaving 2 to 3 feet between plants in a row and 7 to 10 feet between rows, so the melons have room to grow. Water the transplanted watermelons until the soil becomes saturated with water and compresses around the base of the plant.